We sell our produce in a range of ways … as well as our own market stalls and box scheme there are a number of cafes and restaurants where you will find our freshly harvested food). Contacts for more information are at the very end – please read on and hope you get to taste our London-grown food somewhere! 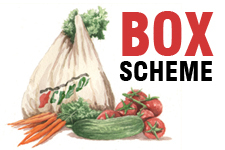 Since 2011 we have be selling our food crops through local food-outlets beyond our own market stalls, box scheme and the Hornbeam Cafe. We have been both inspired and excited by the response we have received from food outlets to London-grown, community inspired food! We encourage our Chef partners to come and support the harvesting and growing work at our site. As the London harvest season kicks in we are delivering produce by foot, by bicycle trailer and in shared vans. .
Back in the kitchen with the salad! The Deli Station – Sharing vans includes a partnership with The Deli Station (Enfield base), an artisan food distributor run by Ben & Jo, based around the corner from our growing site in Enfield – they support our work because of their strong ethical base in the slow food movement. With The Deli Station we currently deliver weekly to Opera Tavern (Covent Garden), Dehesa (Regents St), Emberyard (Soho), The Clove Club (Shoreditch), Tom’s Diner (Chelsea and Canary Wharf), and to local restaurants Il Bacio (Buckhurst Hill) and Eat 17 (Walthamstow), working with chefs who really value Organiclea produce for its freshness and flavour. This summer we are supplying Heritage Tomatoes, many of which are almost extinct varieties from Essex and the LeaValley (see our growers blog), basil and cucumbers. The Euston loop – we send around 15kg of mixed salad to outlets in Islington, Euston and Kings Cross, arriving within 24hours of harvest. These outlets share our belief in the importance of food produced with integrity and have been striving to achieve this with their varied food outlets. 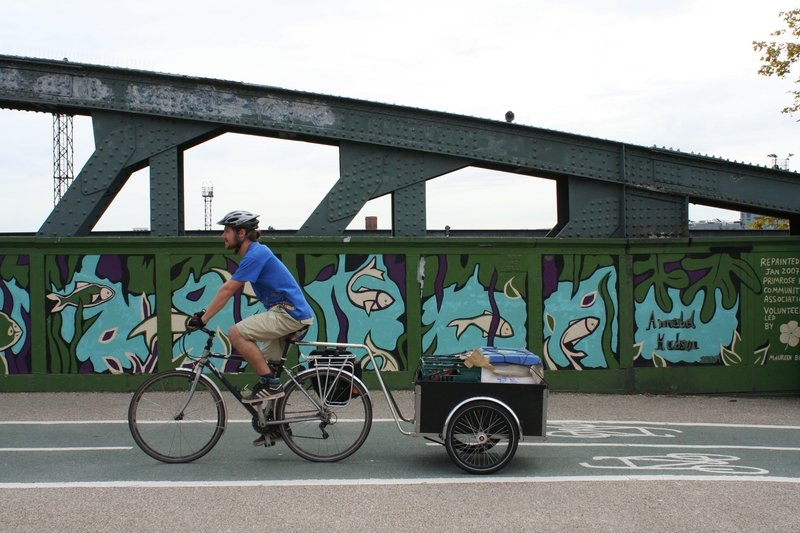 Our deliveries to Islington and Euston are in partnership project with East London social enterprise Bikebox, working to see how to see how more food can move around this city’s networks by bicycle whilst training young people with cycle delivery skills. Friends House – the Quaker Centre (Euston Road) A meeting/conference venue on Euston Road with a café and facilities that ‘don’t cost the earth.’ Also the administrative house for the Quakers in the UK. Duke of Cambridge (Islington) London’s only Organic Certified pub makes use of fresh produce from all over London and works closely with local farmers. They support gluts by preserving and storing produce, work to keep their carbon footprint down, the Duke is a special treat of a restaurant. Hornbeam Cafe (Walthamstow) Part of the Hornbeam Environment Centre, the Hornbeam Cafe is open 6 days a week for cakes, lunches and regular supper clubs. The kitchen is run by local catering team ‘Norman Loves’ and they aim to run a zero food waste kitchen and source their ingredients locally and Organically. Lot 107 (Walthamstow) Family run cafe on Wood St. Great for breakfasts and lunches. 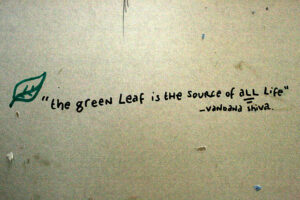 Sources much of their produce locally and organically. Committed to weekly deliveries of Organiclea mixed salad. The Three Colts (Buckhurst Hill). 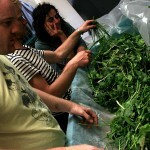 Chef Steve comes to collect salad and herbs and other produce every Tuesday from Hawkwood Nursery. Il Bacio (Buckhurst Hill). Luigi discovered Organiclea basil on a visit to Hawkwood and we supply a large crate of basil weekly through the summer months. Grocers: You can also find our mixed salad weekly in Second Nature (Wood Steet, Walthamstow) and salad plus occasional other specialities at The Spar (Walthamstow Village). Cut flowers: we grow flowers on our market garden, edible flowers to put in our salad mix, and others to encourage beneficial insects and help with pest management. So we supply cut flowers wholesale or retail as posies and bouquets (minimum 10 stems) – details here.